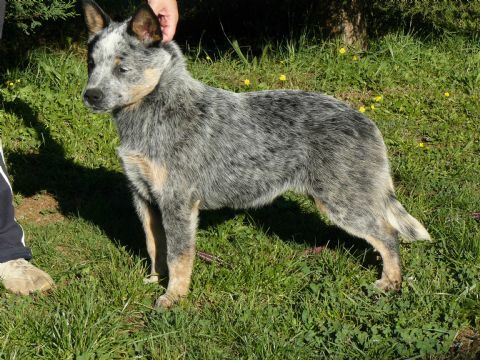 We are owners and occasionally breeders of Australian Cattle Dogs. We take very serious consideration as to the temperament of the dogs that we breed with as it is of the upmost importance to us. We also take very seriously the testing for Hereditary Diseases eg.PRA in our breeding dogs. Our pups are sold with a 7 day money back guarantee as to the state of their health, registered with Dogs Victoria, vaccinated, microchipped, vet checked, regular worming, BAER tested, 6 weeks free puppy insurance, socialized with young children. We arrived at our Breeders Prefix by taking the names of two of the dogs we showed back in the 70`s one being Vesterose Blue Pepper, the other was owned by George Mumford which was Beaufield, so we became Beauvest. We showed for a number of years before children and full time work intervened. But having now retired we have restarted our affair with the Australian Cattle Dog. We live in the Yarra Valley area which is a great place to live. Gives the dogs plenty of exercise too. We are members of Dogs Victoria. We are also members of The Australian Cattle Dog Society of NSW. And members of The Australian Cattle Dog Club of Victoria.